'Tapestry' King started out as a songwriter with her husband, but it wasn't until after her divorce that she began to sing her own songs and when she did, she sold 15 million copies. In February 1971, a powerful earthquake struck suburban Los Angeles. Not long after, Carole King's "Tapestry" was released. "So I don't know if people are giving me responsibility for having caused the earthquake or else they think it was inspired by the earthquake, but whatever," Carole King remembers. "I just read 'For Whom the Bell Tolls' by Ernest Hemingway, and when they speak about the earth moving, it's when they make love. And I figured, `All right, I'll go with that.'" "Tapestry" was Carole King's second solo album. Her first was called Carole King "Writer," and until then, that's just what she'd been, a tunesmith, writing the melodies to lyrics by her husband Gerry Goffin. Throughout the 1960s, King and Goffin were one of the most successful songwriting teams in the country, cranking out hit after hit: "Locomotion" for Little Eva, "Up On the Roof" for The Drifters, "Natural Woman" for Aretha Franklin, among dozens of others. Their first song to reach number one was "Will You Love Me Tomorrow" for the Shirelles. King was 19 years old. Not only did she write the music, she did the arrangement and played piano on the record. 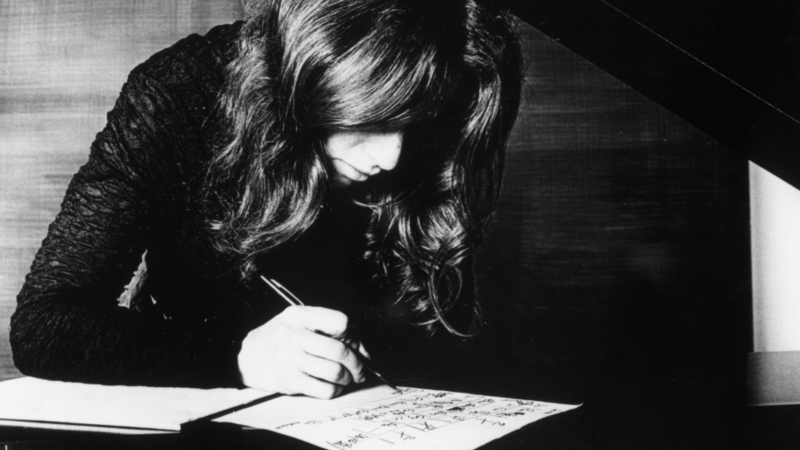 Though Carole King was known for writing songs for others, she also had a pretty good reputation in the industry as a singer because of the demo tapes that she'd record of songs she wrote with Goffin. At the time, her publisher was Lou Adler. "She would play the piano, sing the lead, then sing the backgrounds and put on other piano parts to emulate strings or another instrument. And when I would send these around to the producers and A&R men of the different artists, I could never get them back, they liked them so much. They were, like, within the industry--her demos were famous." One of those demos, a song King and Goffin wrote for Bobby Vee, was released commercially in 1962. Carole King did little to promote "It Might as Well Rain Until September," She says she was perfectly happy writing songs for other people and never aspired to become a solo artist. Then, in 1968, she and Goffin divorced. "In those days, I didn't really write lyrics, didn't need to," King remembers. "After we got divorced, I needed to. And I really wondered if I could do it, but I guess I did." Her first album got good reviews but didn't sell particularly well. For "Tapestry," Lou Adler, who stepped in to produce, says he wanted to capture the natural quality he'd heard on her demos. "And that was to try to do an album where you could visualize Carole King sitting at a piano, tying the piano to the artist and having Carole do as much of the background vocals as possibly and never getting too complicated with the instrumentation. It's a fairly simple recording." "Tapestry" includes songs King wrote herself, several older tunes she wrote with Goffin and two songs with words by a completely unknown lyricists named Toni Stern. Stern says she remembers clearly the day she wrote the words to "It's Too Late," the record's biggest hit. "I was feeling rather blue, looking for love, not being able to find it. And the first line came to me and the rest of the song just flowed. It flowed sequentially. There was hardly a rewrite in it that I can recall." "Toni would give me an entire lyric," says King. "It would be on the page. I would look at it and music would come. Just from looking at the lyric, it suggested music." For Carole King the process of creating "Tapestry" was very different from sitting in a little office with her husband composing songs for other people. Toni Stern remembers writing lyrics, then going over to King's house where the composer was trying to raise three kids. "And I can just remember her--this is her third baby--just picking up that baby's bottom and slapping some olive oil on his bottom and just, like, writing songs with one hand and dressing up a baby with the next. And it was very, very funny for me. She was, like, playing the bass with her left hand and diapering a baby with her right." "Tapestry" was recorded in just three weeks with a stripped down band that included Joni Mitchell and James Taylor. King's everyday voice and personal lyrics connected with a huge audience. In its first year, "Tapestry" sold more than seven million records. Lou Adler says people liked it because King came across as someone they could relate to. "She's a nice Jewish girl from Brooklyn. You know, she's a very nice girl. Her mother was a teacher and her father was a fireman." Adler adds that one of the things listeners related to was the vulnerability Carole King projected in her songs. That came to be one of the hallmarks of the singer-songwriter era that King helped launch along with James Taylor and Joni Mitchell. King says she was just trying to do what she'd always done, write basic pop songs.
" I don't think I consciously tried to be simple. I gravitated toward simplicity in melody and it just has to make sense. There's a logic to melody. To explain it would be difficult. It would be like describing what an orange tastes like." Sweet, pure and simple--songs that helped "Tapestry" sell more than 15 million copies worldwide to date. As one critic wrote, `They aren't pop ephemera anymore. They're permanent parts of our culture.' For NPR News, I'm Elizabeth Blair in Washington.